← Our Beheaded Baby Goat Went Viral (The Awl. Feb. 2015). 1) (March 11, 2015) CLICK HERE to read about a new movie called “The Lot,” filmed in, and about, Algiers Point. (March 4, 2015) Local musician and inventor Mr. Quintron could not have conjured up his newest creation, the Weather Warlock, without the help of Tulane’s radio station, WTUL. The Weather Warlock is a seven-foot tall synthesizer that reads all aspects of the weather – temperature, precipitation, wind, sunlight – and turns it into droning, therapeutic abstract music. The idea began when WTUL gifted Quintron two old, antique mixing consoles, thinking he might need them, for something some day. “That particular type of console inspired me to build the Weather Warlock,” says Quintron. The Weather Warlock has been a hit with kids at New Orleans schools and libraries, from Uptown to Algiers, and at select spots on Quintron’s extensive worldwide music tours with his puppeteer wife, Miss Pussycat. 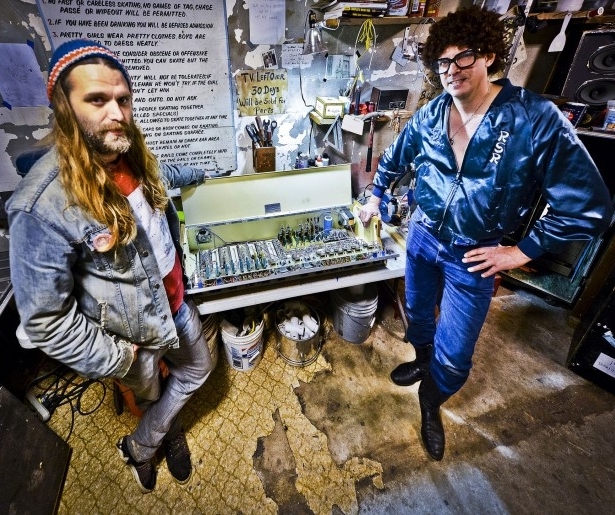 Quintron has also put together an improvisational heavy metal band that plays along to the Weather Warlock during sunsets – the noisiest time of day for the invention. This Mothers Day will see the release of the first Weather Warlock album. This Saturday, March 7, at One Eyed Jacks, Quintron will repay his debt from behind his organ, as he provides “funeral music” for Lea’s show, The Dropout, which will soon (ahem) drop out of its time slot. With no radio show, Lea will now focus his DJ GrisGris persona on his VHS-based found-sound and video art, which he displayed at most of Quintron’s local concerts in 2014. Behind the decks and the VCR for WTUL’s upcoming marathon weekend, Lea says his funeral roster will include the garagy bands Babes and Heavy Lids, the twangy Bobby Peters, 60s garage throwbacks the Planchettes, plus Woozy, featuring John St Cyr from Native America.